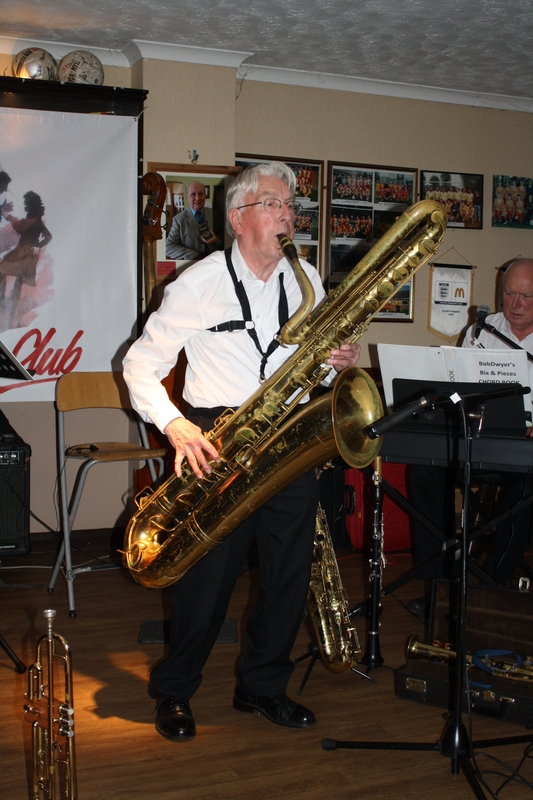 John Bayne on bass sax (big Bertha) with Bob Dwyer’s Bix & Pieces at Farnborough Jazz Club on 29th January 2016. Photo by Mike Witt. 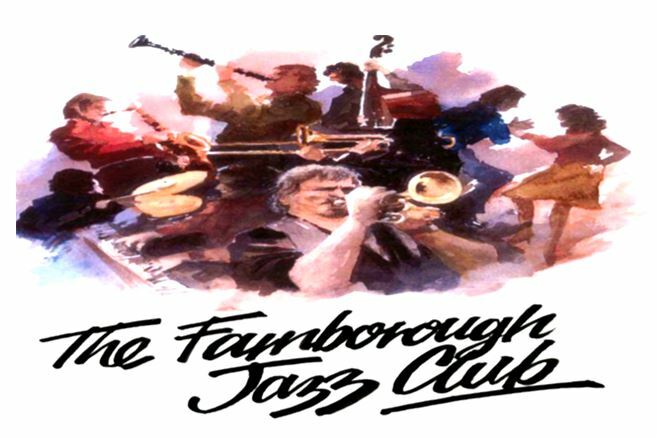 BOB DWYER’S BIX & PIECES jazz band will be here at FARNBOROUGH JAZZ CLUB on FRIDAY, 14th JULY 2017. 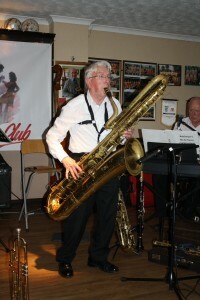 Band leader BOB (trombonist &vocalist) will be joined by CHEZ CHESTERMAN (trumpet) and ALAN CRESSWELL (clarinet), plus the engine boys will include HUGH CROZIER (piano &vocals), JOHN BAYNE (double bass & a real treat on bass sax), DAVE PRICE (banjo &guitar) and GRAHAM CAULICOTTE (drums). 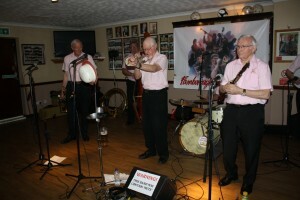 Unless you are new here, you will all know by now that this band will always play brilliantly for us. You can expect variety and good dancing tempos to boot. If you haven’t tried our club before, don’t be shy to give us a try. You won’t be sorry, I’m sure you will enjoy the fun. Lovely Shepherd Neame beer at club prices and plenty of free parking …..
and Diane and Keith will be your hosts for the evening. This entry was posted in Bob Dwyer's Bix & Pieces on July 12, 2017 by Diane. Ol’ George ‘Kid’ TIDIMAN has his full band on tonight here at Farnborough Jazz Club tonight, Friday, 7th July 2017. 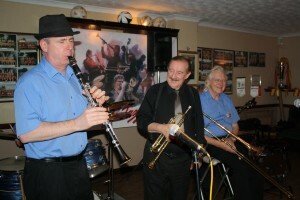 George (on trombone) will have with him that wonderfully talented lot, DENNY ILETT on trumpet, with TIM HUSKISSON on clarinet, ‘SOUTHEND BOB’ ALLBUT on banjo & fantastic vocals, JOHN SIRETT on double bass and BILL FINCH on drums. 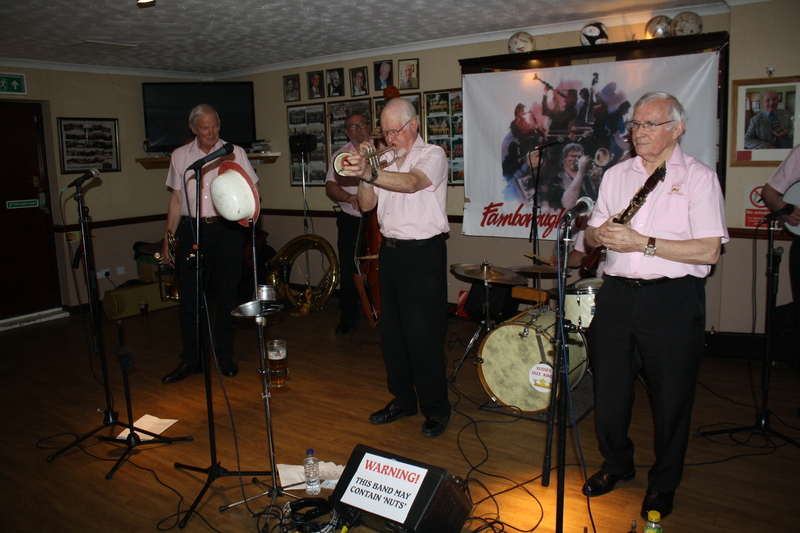 Come and join in the fun and dance all evening to this lovely band. We will have all the doors and windows open, so with that lovely breeze, you shouldn’t feel as hot as it is right now, beautiful as it is (28˚)! This entry was posted in George 'Kid' Tidiman's All Stars on July 7, 2017 by Diane.